The Buddhist teachings and methods are handed down from teacher to pupil following an oral tradition, a tradition that is ultimately traceable all the way back to the Buddha Shakyamuni himself. This tradition gives us an assurance of quality and authenticity. Out of all Lama Jigmé’s many great teachers, Khenpo Jigme Phuntsok Rinpoche was the most pivotal. 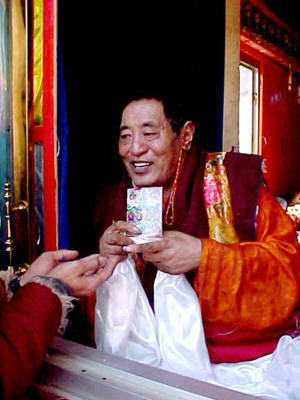 His Holiness Khenpo Jigme Phuntsok Rinpoche started giving teachings in the 1980s in a valley in Kham in Eastern Tibet. Many Tibetans, Chinese and Westerners travelled to the valley to follow his teachings, which culminated in the foundation of the Buddhist Institute Serthar Larung Gar. In 2001 more than 8,000 monks and nuns lived there. Under Khenpo Jigme Phuntsok Rinpoche’s tutelage, thousands of devotees matured into becoming teachers. Serthar Larung Gar was an ecumenical institution, according to which no distinctions are made between this or that Buddhist school, bringing them all together into one. In 1990 Khenpo Jigme Phuntsok Rinpoche travelled to India and Nepal, at which time he re-established his connections with His Holiness the Dalai Lama. As the recognized re-incarnation of the Bodhisattva Manjusri, Khenpo Jigme gave HH the Dalai Lama teachings. Khenpo Jigme passed away 7 January 2004 at the age of 70.